Żabbar (Maltese: Ħaż-Żabbar, [ħɐzˈzɐbbɐr]), also known as Città Hompesch, is a city in the South Eastern Region of Malta. It is the sixth largest city in the country, with a population of 15,404 as of March 2014. Originally a part of Żejtun, Żabbar was granted the title of Città Hompesch by the last of the Grand Masters of the Order of St. John to reign in Malta, Ferdinand von Hompesch zu Bolheim. The name of the city probably derives from the Maltese word tiżbor, the process of pruning trees. Indeed, a number of families who specialised in pruning, żbir, are known to have lived in the vicinity of this village during the Middle Ages. Other possibilities of this derivation exist. Żabbar was also the surname of an important family that was known to have lived in the area. Ħaż-Żabbar could also have been a corruption of Ħas-Sabbar (the consoler village), because people from all over the island used to visit the village to pray to Our Lady of Graces for consolation. The word sabbar could also be the plural of sabbara (the Aloe vera plant) in Maltese. This would be derived from the Arabic صَبّار (ṣabbār) meaning cacti. In fact, in some Arab countries ṣabbār means prickly pear. The "ṣ" in this case, is strong and is pronounced as "z". Judging by the names of other Maltese villages, like nearby Żejtun (meaning "olive" in Arabic) it seems quite probable that such names may have agricultural connotations. Ħaż-Żabbar is bound to the north by Kalkara and Xgħajra, to the west by Fgura and the Cottonera Lines (enclosing the localities of Vittoriosa and Cospicua), to the east by Marsaskala and to the south by Żejtun. Ħaż-Żabbar has the largest population of all localities within the area. The western part of this town, composed essentially of Il-Biccieni and Tal-Bajjada (also known as Il-Misrah) areas, is characterized by high dwelling density and comprises a series of winding streets that define the village core. The eastern half is mostly suburban with more recent developments mostly in the form of terraced housing and modern maisonettes and apartments. Ħaż-Żabbar has two other distinct residential neighbourhoods namely Bulebel iz-Zghir, which is characterized by Government housing estates/ multi-storey apartment blocks and rows of terraced house units that were constructed out of various Home Ownership Schemes (HOS), and the area referred to as St. Peter’s. The town was used as an encampment by the Ottoman armies at the outset of the Great Siege of 1565. Ħaż-Żabbar was granted city status by the last Grand Master on Malta, Ferdinand von Hompesch, in whose name the population built a triumphal arch on the main approach road from Paola through Fgura. During the Maltese uprising against the French between 1798 and 1800 the city was used as a base by the Maltese insurgents. A memorable battle took place in front of the Ħaż-Żabbar Sanctuary. To this day, French-era cannonballs are to be seen in household walls in the city's older parts and some are also in the church museum after being retrieved from the old church dome. During the British era a number of forts and batteries were built in the area. These were Fort Saint Rocco, Fort Saint Leonardo, Delle Grazie Battery and Żonqor Battery. Fort Saint Rocco was built between 1873 and 1875. It was later expanded and 3 cannons were fitted. Also, Fort Saint Leonardo was fitted with 4 cannons. These two forts took care of the neighboring seas. The two batteries also took care of the area altogether with the Rinella battery which contains the famous 100 ton Armstrong Gun. A memorable date for the Żabbarin. The then Metropolitan Archbishop of Malta Michael Gonzi crowned the miraculous image of Our Lady of Grace venerated in her Sanctuary. A large crowd gathered in front of the Sanctuary on Sunday 2 September 1951. During 2001 a twelve star silver diadem was placed on it by Archbishop Joseph Mercieca, in celebration of the Golden Jubilee. More recently, on 14 October 1975, Vulcan B. 2, XM645 of No.9 Squadron RAF, exploded over the village with many parts of it falling on the school and one wing full of fuel on Sanctuary Street, the main street of the village. Fortunately the children were having their break at that time and were safely evacuated by the supervising teachers and headmaster. The whole accident, which involved other parts of the city, due to the violent explosion, claimed six victims. Five of them were crew members trapped in the plane. The sixth was a civilian, who was hit by an electricity cable torn down by the falling wing. Various items (including the aircraft undercarriage) can be seen at the Żabbar Sanctuary Museum. The city is very devout, particularly to Our Lady of Grace, to whom the city Sanctuary is dedicated. A vast number of paintings and other artefacts can be found in the Sanctuary Museum, most of which have 'VFGA' in some way or other imprinted on them. This is the Latin abbreviation for Votum Fecit, Gratiam Accipit, meaning that a grace has been asked for and it had been granted due to intercession by the Madonna tal-Grazzja (Our Lady of Grace). The paintings are about marine subjects and give large detail about ships of the Knights of Malta era. The Mattia Preti painting, found in the town's museum, is a particularly beautiful painting. The building of the Church of Our Lady of Graces was started in 1641 at the instigation of the Parish Priest Don Francesco Piscopo and was completed in 1660 according to another. A Maltese proverb says "a church is never finished", which is another way of stating that the people in a particular parish are never satisfied with their own church and, depending on their means, are forever the ambition that the church in one’s village be better and bigger than the church in the next parish. The good people of Ħaż-Żabbar are no exception. Largely from the private funds of the Parish Priest Andrea Buhagiar, in addition to money collected from the people of Ħaż-Żabbar, work on embellishing the church was started in 1738. The Maltese architect Giovanni Bonavia redesigned the façade and two belltowers were erected; in addition the church was paved in marble and provided with a crypt. The main painting of the Madonna and Child is a work by the painter Alessio Erardi (1669–1727). Ħaż-Żabbar is famous for its village feast on the first Sunday after 8 September, which features a motorcycle and bicycle pilgrimage each starting from Mosta and Rabat respectively. This is done because Our Lady of Grace is the patron of cyclists. 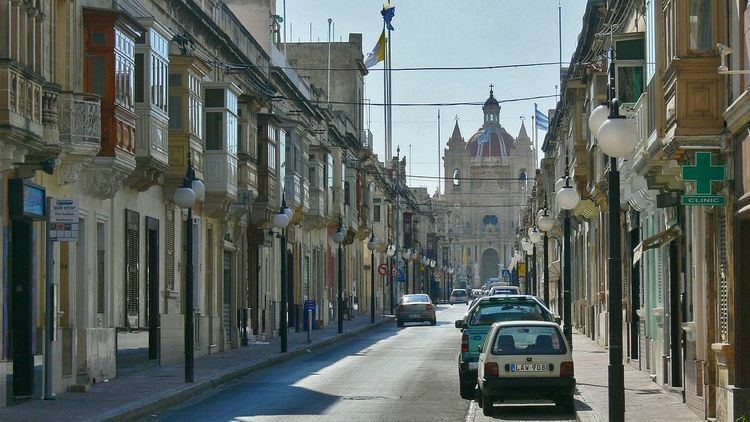 Strong competition exists between the village's two band clubs, locally known as the Società Filarmonica Maria Mater Gratiæ (sporting blue and known as Tal-Baqra) and the Għaqda Madonna Tal-Grazzja Banda San Mikiel (sporting green and known as Tal-Bajda). Another feast celebrated in Ħaż-Żabbar includes St. Michael the Archangel on the third Sunday after 8 September. This feast includes a solemn mass at the Zabbar Sanctuary. During the evening a brass band march is held in the town centre. The band accompanies the statue of St. Michael the Archangel. The most sensational moment during this march is when the statue of St. Michael the Archangel passes in front of the monumental statue of Our Lady of Graces, the patron of Żabbar. A procession of Our Lady of the Rosary is also held on 7 October. Ħadd in-Nies or People's Sunday is celebrated on the first Sunday of Lent. An afternoon pilgrimage, having a different starting point each year, is led by the Archbishop of Malta and ends at the Our Lady of Grace Sanctuary where a pontifical mass is celebrated. Among the celebrations for this feast one can mention the Classical Music Concerts held by the two local band cubs in the Notre Dame Hall. Our Lady of Graces Club - St. Michael Band (L-Għaqda Madonna tal-Grazzja - Banda San Mikiel). Founded in 1883. The Maria Mater Gratiae Philarmonic Society organises an annual Holy Week exhibition held inside the club where it is situated. The exhibition, which is named Pesah, consists of :- life sized last supper, various models of the passion of the Christ, pictures made out of coloured semolina, a fretwork exhibition and other symbols which transform the whole building in an exhibition. The Għaqda Madonna Tal-Grazzja Banda San Mikiel organises an annual Holy Week exhibition. This exhibition, held inside the World War 2 Shelter in the square where the Għaqda Madonna Tal-Grazzja Banda San Mikiel club is situated, includes life size figures depicting the Passion of Christ. This chapel is situated in Main Street between the Labour Party and St.Patrick F.C. Clubs. It is dedicated to the Annunciation. Dedicated to the Assumption of Mary, this chapel is found in one of the oldest quarters of Ħaż-Żabbar. A painting on the altar shows Mary being transported into Heaven with her body and soul united. A very nice statue of Our Lady of Sorrows is found in this chapel. This is used for the teaching of Catechism and Mass on certain days of the week. Built in the 15th century this chapel is found next to Santa Domenica Church. Nowadays it is used, together with Santa Domenica Church, as the headquarters of the local scout group. This was rebuilt in 1954 after being damaged during World War 2. Together with Saint Andrew's Church, Santa Domenica Church is nowadays used as part of the local scout group's headquarters. This chapel is found in the town's cemetery. It is used for funeral services and for mass. This is a very small church. In 1585 Ġuzeppi Testaferrata donated money and helped to organise the feast dedicated to Our Lady. Currently the chapel is not being used. Ħaż-Żabbar has been twinned with the City of Villabate (in Provincia di Palermo) since September 1997 when a twinning Protocol was signed. The Council was officially invited to Villabate when Dr. Fina, as a Comissario Straordinario, was responsible for the running of the day-to-day business. The invitation was the result of an annual reciprocal activity with regard to the Onorificenza Cittadino Del Anno. This commitment is now being honoured on a reciprocal basis. Besides the Twinning with Villabate the Council also has a Partnership Agreement with three other European cities namely, Montgeron, Povoa’ de Varzim and Eschborn. The Partnership Agreement was signed in July 2001 during the International Youth Summer Camp organised by Ħaż-Żabbar. Ħaż-Żabbar's main football team is Zabbar St. Patrick FC., including St. Patrick's Nursery FC. There are two amateur football teams in the town, and these are Ħaż-Żabbar Crystal Blues and Ħaż-Żabbar Athletics. Other sports clubs include Ħaż-Żabbar Shooting Club, Ħaż-Żabbar Boċċi Club, St Peters Boċċi Club, Ħaż-Żabbar Subbuteo Club, Zabbar Chievo Futsal Club and Ħaż-Żabbar Amateur Racing Club.